In a change of pace from the normal SoC related MediaTek news, today we see the announcement of a new discrete biosensor from the Taiwanese chip manufacturer. The new Sensio MT6381 is a health monitoring solution which integrates six key measurements data points into an all-in-one package which can be integrated into smartphones. While the Helio series includes the popular SoC lineup of MediaTek, the Sensio branding is a new marketing effort by the company to give more exposure to its new and future sensor business, of which the new biosensor is the first announced product. 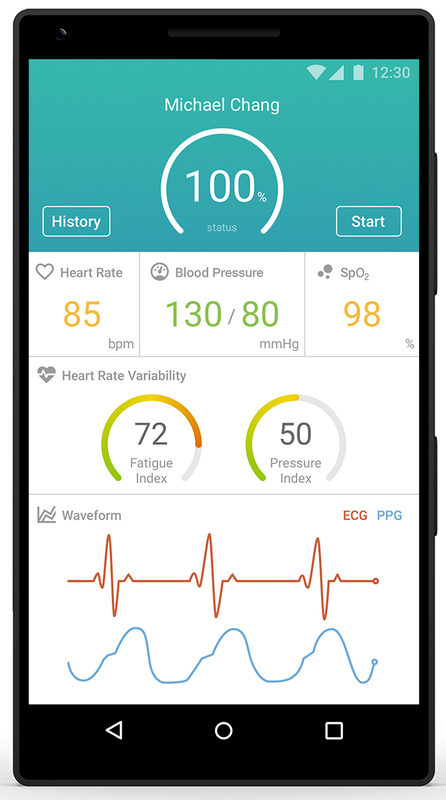 The industry leader in biosensor solutions is currently Maxim Integrated who also are the component suppliers of the heart-rate monitor module integrated into Samsung Galaxy smartphones, undoubtedly the smartphone line-up which popularized and became the trend-setters in regards to integrating health monitoring solutions into mobile phones. While the wearable market has seen more widespread adoption of biosensor integration, outside of Samsung Galaxy phones there’s been sparse to close to no adoption of such solutions (Please correct me if a device comes to mind! ), which considering that Samsung first introduced the sensor in the Galaxy S5 close to 4 years ago is quite a bit odd. 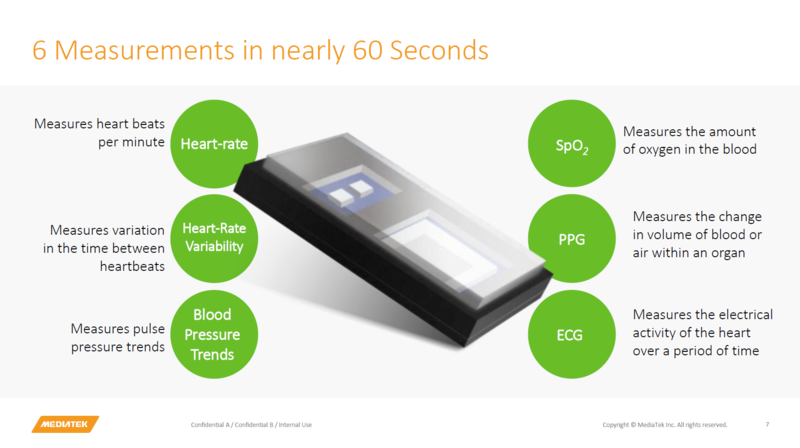 The first four features can be found in today’s Galaxy phones and existing biosensor solutions but it’s the integration of ECG and PPG that stands out as additional features exclusive to MediaTek’s new offerings. The sensor is actually a discrete pre-assembled integrated package consisting of package housing, substrate, the actual front-end IC and sensor assembly, protected by a glass cover. Red and infra-red LEDs serve as the illumination sources for the light sensitive sensors which measure the light absorption by a user’s fingertips and with help of some processing convert that input data into heart-rate and blood pressure and oxygen measurements. The ECG and PPG functions which we haven’t seen so far seen integrated into smartphones are also handled by the package with help of two additional simple electrodes that the OEM has to implement into a device’s housing. When the user then touches both electrodes with a finger on each hand this creates a closed loop between the device and the heart to enable ECG measurements. The MT6381 is marketed as a complete solution and with that also comes the software support. As such MediaTek offers all related software as well as an in-house and 3rd party application for health monitoring, which should ease adoption for low-cost OEMs. 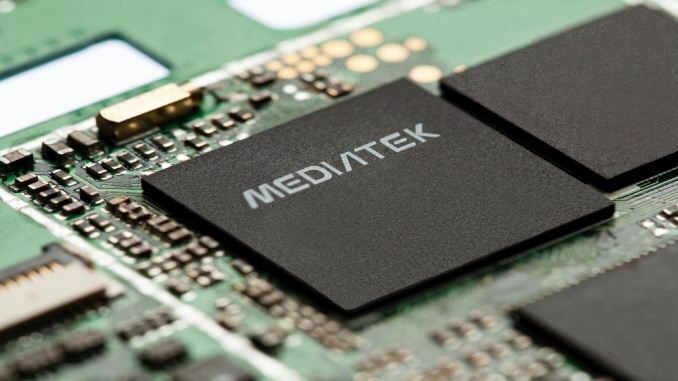 All in all while maybe not as exciting as a new SoC, MediaTek’s new biosensor does open up the possibility of wider market adoption of integrated health sensors into smartphones. MediaTek also explains that the target application device for the MT6381 is indeed smartphones as opposed to wearables, a decision linked to simple market opportunity and demand for a integrated solution in this segment. The new Sensio sensor will be made available to MediaTek partners in early 2018.
" I think we should all be a tiny bit distrustful of the smartphone fruit we've been offered and the "free" services available on them." Why only a *tiny* bit? Did Snowden teach people nothing? I'm yet to be convinced of the need for a "smart" phone, and I'm waiting for a brand I can trust that won't track me geographically in real time, report everything I view to a conglomerate that will sell my interests to advertisers (or to others with shadier aims), nor be a closed code platform that I cannot trust is not being hijacked (including features like cameras) to spy on me and everyone in range. If a phone doesn't offer those features, I cannot care how fast "Geekbench" says it is. My old Nokia is doing just fine, thanks. ;) An umbilical cord to Twitter and Facebook is *not* a requirement of modern life. Careful there- you're basically describing the complete relinquishment of any sort of privacy. Complete and open biometric/tracking/data collection is very easy to abuse.